Football League Divison Two leaders Tyrone beat Derry by nine points, 2-15 to 0-12, in the Ulster derby at Healy Park to remain unbeaten in 2016. 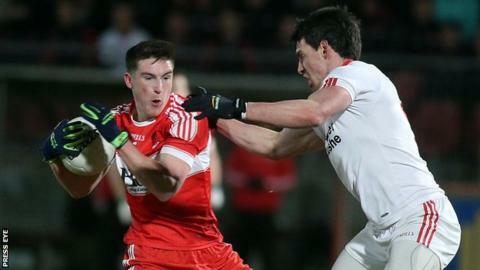 Trailing 0-4 to 0-2 early on, Tyrone bounced back to lead 0-10 to 0-6 after a first half which saw defences on top. A Sean Cavanagh goal made it 1-13 to 0-9 to the hosts, then Derry had captain Chrissy McKaigue sent-off for a second yellow card offence late in the game. Aidan McCrory found the net to complete a convincing success for the Red Hands. For Derry, it was another disappointing defeat following their home loss at the hands of Galway last week. O'Neill top-scored for Mickey Harte's side with six points, with Cavanagh contributing 1-3 and Richard Donnelly 0-4. James Kielt landed three points for the Oak Leafers, who also lost to their Ulster rivals in the McKenna Cup final in January.